Visit to Brodie Engineering Ltd at Kilmarnock hosted by Stephen Birnie, Business Relations Manager, Brodie Engineering Ltd. Visit of 9 April 2019. 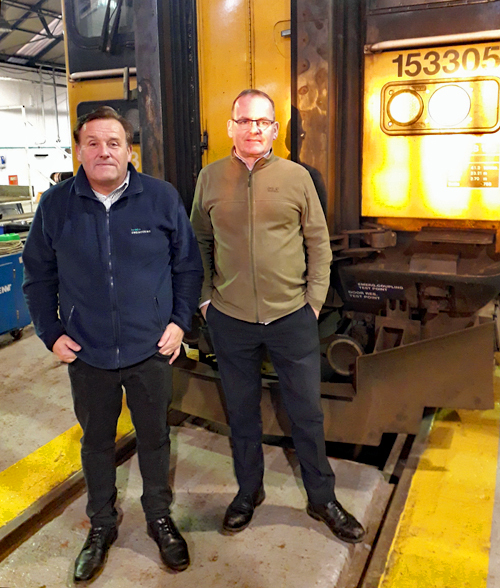 Brodie Engineering is a new player on the Scottish railway scene, whose first big contract was to refurbish ScotRail's entire Class 334 fleet. Since then it has gone on to undertake repair and refurbishment work for other train operators, and it created Ireland's first-ever luxury touring train the Belmond Grand Hibernian. Brodie Engineering was founded 22 years ago and operated initially out of some industrial buildings at Irvine. When Network Rail decided to downsize their accommodation for track machines, an opportunity arose to move in 2010 into their rail-connected plant maintenance depot at Kilmarnock whose initial two roads have since been doubled to provide cover for 14 23-metre vehicles, with room for 10 more in the yard. Now Brodie's employs 83 permanent staff including 17 apprentices, with several staff on a mature apprentice scheme. It offers capability for paint spraying, lifting, fabrication and sheet metalwork, and has a traverser to move vehicles across the shed and a shunter to shift them round the yard. With mechanical and electrical design facilities, Brodies can undertake product engineering, three-dimensional modelling and regulatory compliance. As well as internal and external overhauls, the business carries out accident and corrosion repairs, including work off-site, and has recently been busy upgrading vehicles to conform to the forthcoming requirements on Persons of Reduced Mobility. Brodie's first big contract for ScotRail was refurbishment and reliverying of the 40-strong Class 334 fleet. Its most prestigious order was repurposing ten Irish carriages for the luxury train the Belmond Grand Hibernian. Brodie's has helped Caledonian Sleeper to commission its new Mark 5 fleet from Spanish trainbuilder CAF, and a forthcoming task for ScotRail will be to convert five single-car Class 153 trains now at Kilmarnock to carry bicycles and other outdoor sporting equipment on Highland routes for which concept designs have been prepared showing a seating area, catering facilities and space for 20 bikes with flexible storage for skis. Brodie Engineering also undertake bespoke design and manufacture work for specialist equipment, including rail handling machines for both Network Rail and the Glasgow Subway. The Scottish Region thanks Stephen Birnie and Jim Thomson for a fascinating visit.